Hanging Off The Wire is pleased to offer this giveaway which is hosted by Tammie's Reviews, Giveaways and More and sponsored by Good Cook. The 3-piece Fresh Fruit Bowl is only available from Bed Bath & Beyond. Summer is here and for me that means cookouts, vacations and fresh fruit. I love all things fresh fruit. I do not think there is a kind of fresh fruit that I would not eat. I love to visit my Mother-In-Law as she always has a bowl of fruit salad in her fridge. I have noticed that the fresh cut fruit started to taste funny - soggy and old. I do not know if you know what I am talking about but I was just introduced to a 3-piece fresh fruit bowl that I can only describe it as amazing. It keeps watermelon and cut fruit fresher longer. The 3-piece fresh fruit bowl comes with a large bowl that sits in another bowl that collects the liquid from the first bowl and a lid. This product is only available at Bed Bath & Beyond. 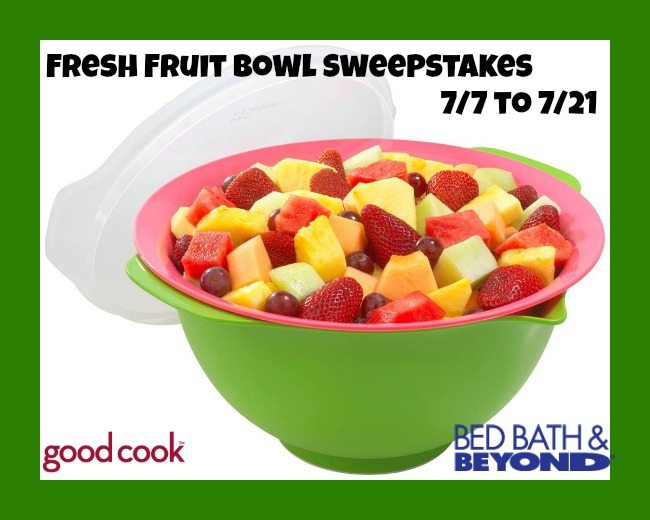 1 reader will win a Good Cook 3-piece Fresh Fruit Bowl. This is open to the U.S. only. The giveaway will end on 7/23. Only 1 winner per product - This means if you have won the same product on another blog, you are ineligible to win. Please enter using the easy Giveaway Tools Widget below and Good Luck! Disclosure - Hanging Off The Wire was not compensated either by free product or payment. I have not been compensated for this post. All opinions and experiences are my own. Open to the US, must be 18+. Confirmed Winner(s) will be contacted by email and have 24 hours to respond before a new winner will be drawn. No purchase necessary. Void where prohibited by law. Entrants must only enter with either one email address, IP address and/or Facebook account, anyone found violating these rules will be disqualified. It is at the sole discretion of the admin of the giveaway if the winner has met the rules or not. The sponsor(s) will be responsible for product shipment to winner(s) of the giveaway. Sponsor will be responsible for prize fulfillment. This event is in no way associated with, sponsored, administered, or endorsed by Facebook, Twitter, Google, Pinterest or any other social media network. The disclosure is done in accordance with the Federal Trade Commission 10 CFR, Part 255 Guides Concerning the use of Endorsements and Testimonials in Advertising. For questions about this giveaway or to have me promote your product, Please email Tammie at PubRel@live.com. For a fruit salad - I would add watermelon, cantalope and strawberries. I would put watermelon, blackberries and pears, they are my favorites and they are so good in fruit salad. I would add watermelon, blackberries and pears, they are my favorites. I love fruit! I would use strawberries, blueberries, watermelon, kiwi, and grapes. I would make it tropical; some pineapple, mango, kiwi and maybe some coconut. I love how these bowls work. The last time I made a fruit salad it didn't say fresh long because of all the liquids settling to the bottom. I would add cantaloupe and watermelon with green grapes.